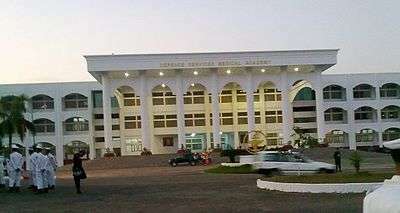 The Defence Services Medical Academy (DSMA) (Burmese: တပ်မတော် ဆေး တက္ကသိုလ်, pronounced: [taʔmədɔ̀ sʰé tɛʔkəθò]), located in Mingaladon, Yangon, is the University of Medicine of the Myanmar Armed Forces. One of the most selective universities in the country, the academy offers M.B., B.S. (equivalent of the M.D.) degree programs. Upon graduation, most DSMA cadets are commissioned with the rank of Lieutenant in the Myanmar Army Medical Corps. The military physicians are to serve the healthcare needs of rural people when they are assigned in the country's remote regions where access to healthcare is poor. The DSMA was founded in 1992 as the Defence Services Institute of Medicine (DSIM) to develop physicians to serve in the Tatmadaw Myanmar Armed Forces. Prior to the founding of the academy, the Tatmadaw had recruited its medical and dental officers from civilian medical school graduates, who had to undergo a month-long basic military training program at the Medical Corps Center. While the medical corps of the Tatmadaw had always been short of physicians, by the early 1990s, the shortage became more pronounced as the military government, fearing student unrest, had shut down most civilian universities, following the 8888 Uprising in 1988. Most civilian universities were closed off and on for much of the 1990s. The military run universities essentially became the only venue for those who wished to continue university education inside the country. The DSIM was operated by the Ministry of Health and the Directorate of Medical Services. The purported "aim of the DSMA is to produce good Medical officers endowed with brilliant physical and mental ability to safeguard The Three Main National Causes" espoused by the military government. The first batch of 47 cadets from the DSIM were commissioned as lieutenants on 17 December 1999, after six years of study and a year as house-surgeons. Through nine intakes, the DSMA produced a total of 1525 medical officers. As of 2008, the DSMA had produced seven Doctor of Medical Science degree holders. The academy is only source of medical officers for the DMS. In terms of Master of Medical Science, by the early 2008, the DSMA had produced 335 specialists, including 48 physicians and 41 surgeons. Nowadays, many army doctors' clinics can be seen in Yangon and specialists of army hospital are also practicing at many private hospitals and clinics. Army doctors are serving the country both in rural and urban regions in the form of private and public practice. The academy accepts approximately 400 students annually. Unlike at the country's other four civilian medical schools, the selection process goes beyond high University Entrance Examination scores. All prospective candidates must be male and must have high enough college matriculation exam scores to enter any civilian medical university. In addition, the prospective student must sit for another entrance exam as well as physical and psychological exams. After 2010, the matriculation examination marks are not considered for entrance. Personal interview becomes the most important step for entrance. The academy has accepted fewer than 100 students a year since 2010, and only 40 students are accepted to DSMA in 2012. The entrance selection including physical fitness tests, teamwork and comradeship screening, psychometric assessments and general interviews process takes about five to seven days at Officer Testing Team (OTT). Only those who pass all the tests and steps above are admitted to the DSMA. Students are eligible for state scholarship programs. The benefit of being a student at DSMA is to get a stipend after acceptance to the school and faster career development than civilian medical doctors. The salary is higher than civilian doctors. The DSMA offers courses for both basic and advanced degrees in medicine and surgery, and runs 20 graduate programs in medical sciences. Master of Medical Science (M.Med.Sc. ); Physiology, Anatomy, Biochemistry, Microbiology, Pharmacology, Pathology, Public Health, Forensic Medicine, Internal Medicine, Surgery, Obstetrics and Gynaecology, Pediatrics, Orthopedics, Anaesthesiology,Radiology, Otorhinolaryngology, Ophthalmology, Mental Health, Rehabilitation medicine, Radiation oncology. Nowadays, many army doctors are studying in public health master's degree locally as well as internationally.The new generation army doctors are likely to take the duty at Ministry of Health and influence the Myanmar health system set up. The DSMA is equipped with lab materials, modern textbooks, and training resources. As intern surgeons, the students must take a field practical tour of duty at military hospitals, where they get field training from professional surgeons. The academy is open year round, and is in session for eleven months of study in an academic year—ten months of medical science coursework plus a month of military science and military leadership. Some DSMA graduates continue their post-graduate education in the UK, India, Thailand, Russia, United States, Germany, Belgium and Singapore. The M.B.,B.S. coursework extends for 7 years and is the same as the major coursework of civilian medical schools such as the University of Medicine 1, Yangon and the University of Medicine 2, Yangon. All cadets are posted for 18 weeks each to the medical and surgical wards for clinical training at the school's teaching hospitals in Yangon. Students attend lectures and clinics in Medicine, Surgery, Child Health, Obstetrics and Gynaecology and are posted to teaching hospitals, including urban health facilities as part of preventive and social medicine teaching. Students study the allied specialties: eye, ear, nose and throat diseases, urology, neurology, tuberculosis, venereal diseases, orthopaedics and traumatology, skin diseases, mental health and psychiatry, oro-maxillo-facial surgery, radiology, radiotherapy, nuclear medicine, anaesthesiology, thoracic surgery, and paediatric surgery. A summative examination is held at the end of the Final M.B.,B.S. Part II course. Problem based learning (PBL),Task based learning (TBL), community based learning (CBL) and behavioural science are incorporated, as relevant. All students, after a successful completion of Final Part 2 MBBS Examination, continue on to hands-on training for one year as house surgeons in the recognized teaching hospitals in Yangon and/or the state and division hospitals. Only after the completion of house-surgeonship is the student awarded the M.B.,B.S. degree. Every DSMA cadet also studies military science and military leadership for one to two months per year from First M.B.,B.S. to Final M.B.,B.S. Part I. After graduation, every medical officer has been trained as a platoon commander. ↑ "Burmese regime figures and supporters". Reserve Bank of Australia. Archived from the original on May 19, 2009. Retrieved 2008-12-13. ↑ "Myanmar university classes resume for 1st time in 3 years". Kyodo News International. 2000-07-31. ↑ "Health Statistics" (PDF). Ministry of Health, Myanmar. Retrieved 2008-11-29.